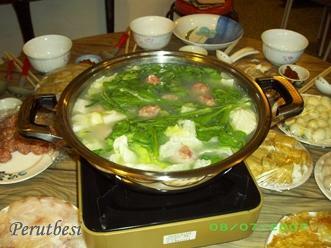 Steamboat is actually just a pot of stock/soup (usually chicken or pork bones boiled with the stem of the 'pak choy' to make the soup more tasty) where you 'throw' in a variety of meat & vegetables to cook before scooping them up with specific utensils i.e. a small ladle & a ladle with holes (not sure what it's called in specific). 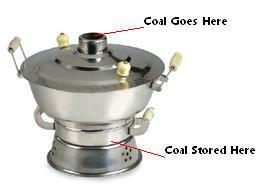 When I first Googled for the origin of Steamboat, what I found was the ship type of steamboat. 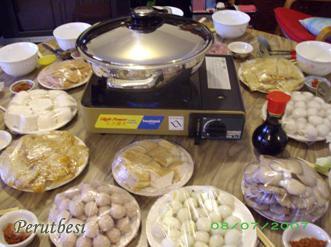 *sweat* Apparently, this food-kinda steamboat is referred to as the 'Hot Pot'. 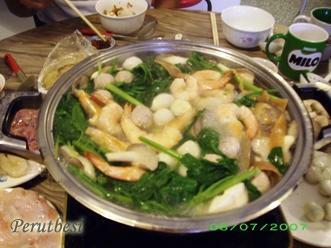 I found out that this dish is usually eaten during winter, when the weather is cold! 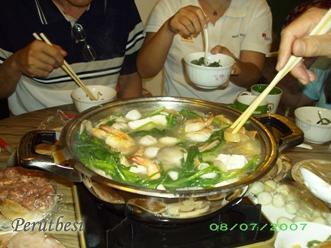 Mmm..I'm sure a hot pot of stock with meat & vegie would do SO good during winter!! :D Reminds me of Korea & the 'Jjigae' dishes, which is the Korean spicy steamboat :P Argh...I miss the good food in Korea & I wanna have some good food in Malaysia!! I'm not gonna ramble 'bout Steamboat for now :P If you would wanna know more about it, check out these sites. 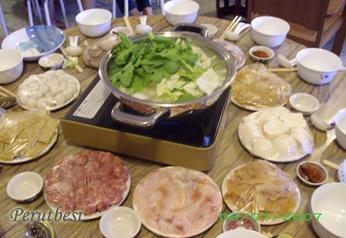 Enjoy the photos & hope that it'll whet your taste buds to crave for some Steamboat! When it's done, it looks like this!